A man caught on video the moment a public art installation in Toledo, Ohio -- a giant, 250-pound red ball -- decided to run away and start rolling down streets lined with parked cars. Part of a Toledo Museum of Art exhibit, the RedBall Project had been wedged between Roulet Jewelers and Ice Restaurant in downtown Toledo when a thunderstorm and strong winds this past Wednesday evening knocked the ball loose and caused it to start rolling away, according to Kelly Garrow, the museum's director of communications. "It started pouring rain, so the ball was wet and slippery," Garrow told ABC News. "The wind picked up, and it popped up and just started going. You can see in the video that's going viral that it rolled about halfway down a block and then mysteriously took a left-hand turn. It made its way partially down the street before people caught up with it." A few "minders" hired by the ball's artist -- along with some museum staff members and bystanders, including a restaurant waiter -- chased the ball down and were able to get a hold of it and deflate it, Garrow explained. The deflated ball was then put into a trailer by art handlers for repair, she said. The ball, which is 15-feet wide in diameter, and a street sign that got bent, were fortunately the only things reported damaged, Garrow said, noting that no one was hurt. "The ball is actually made of the same material as a rubber life raft, so luckily, it was fairly easy to patch," Garrow said. "It was ready the next day, and today, it's at Boyd's Retro Candy Store. It's here in Toledo until Monday, and it'll continue being showcased around the city for the days it has left here." The giant ball was secured to a vehicle on Thursday out of caution, Garrow added. 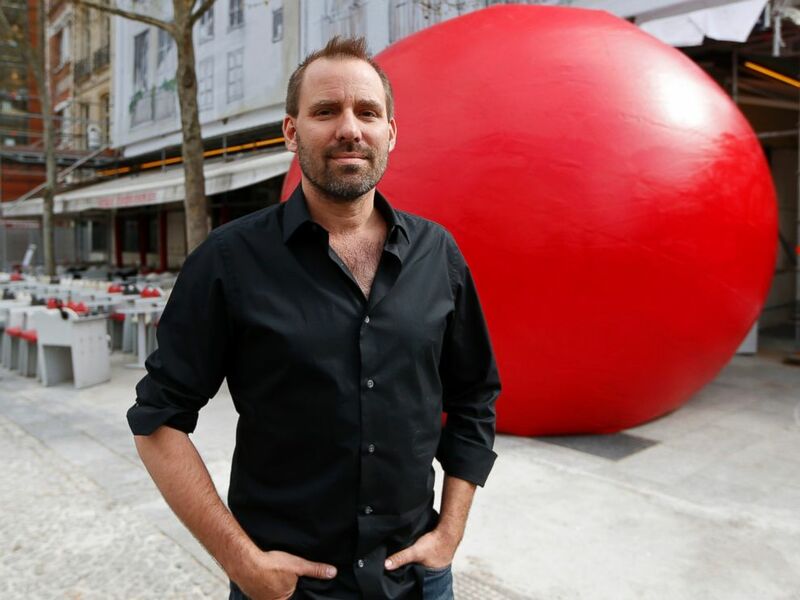 Artist Kurt Perschke poses with his huge red ball as part of his RedBall Project in Paris on April 18, 2013. The RedBall Project is part of the Toledo Museum of Art's "Play Time" exhibition this summer and has been "squeezed into unexpected spaces in cities across the globe," including Abu Dhabi, Paris, Toronto, Sydney and Montreal, according to a news release. "The magnetic, playful and charismatic nature of 'RedBall' allows the work to access the imagination embedded in all of us," the sculpture's artist, Kurt Perschke said. "On the surface, the experience seems to be about the ball itself as an object, but the true power of the project is what it can create for those who experience it. It opens a doorway to the imagination." Perschke told ABC News today he didn't intend the ball itself to have a bit of a runaway imagination, but that when you're working in the public there are a lot of surprises. "In the 10 years of this installation, nothing like this has never happened," Perschke said. "We're just glad no one was hurt. It’s a huge soft ball that doesn’t crush things. However like a boat with lots of sail and no rudder, it can really move in high winds."